This is a solution of social implications of mobile computing assignment help in we discuss on research problem, mobile computing on society and individual, research methodology, data analysis and ethical consideration. With the emergence of new technologies and the growth in the adoption of smart mobile devices, there is a fundamental change in the entire living standards and the business operations as well. The latest mobile technology had made a significant effect on the individuals, businesses and the societies to the large extent. The present study is been largely focused on the emergence of mobile computing and its implications in the society. The study would help in evaluating various aspects with respect to the social implications of the mobile computing in details. With the increase in the use of the mobile devices there has been an increase in the issues as well. It has been recently observed that people have inclined towards these technologies at the large extent which had made them much dependent. However, with the advancement of technologies the security concerns had been also increased. It has been observed that impacts of mobile computing have become serious issues in the society. The people in the society are much surrounded with these technologies and had implied these sources in the daily routines to the great extent. The present study is includes special significance related to the subject matter of mobile computing. It is very important aspect in the present scenario of technological development and its implications. 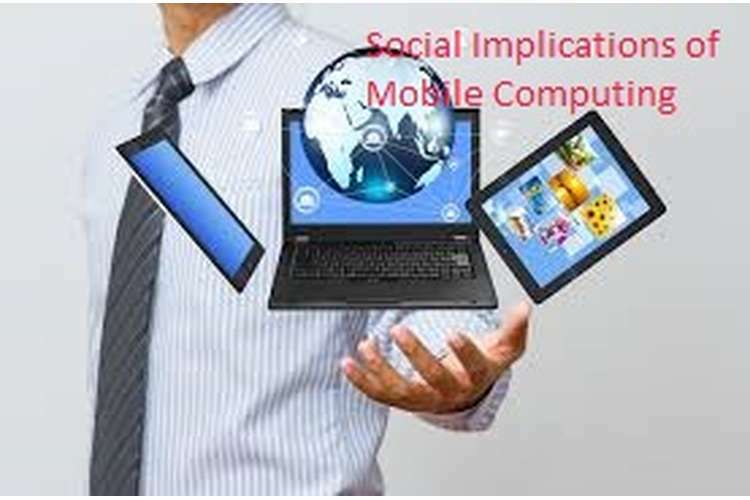 The major purpose behind this study is to evaluate and gain enhanced understanding about the social implication of mobile computing and its impacts over it. The study would facilitate each and every individual making use of the mobiles and other computing devices. The study would also benefit in increasing the knowledge and learning about different mobile computing aspects and would assist the researcher in extracting effective findings and conclusion out of it. Technology in the present era had become the most important and effective aspects which had covered a wide platform of the people either in their professional or personal lives. Technology had emerged its roots in almost all the activities and sectors all over the world. Mobile computing is one of the top most technological advancement which had made the people think in a different way and practice the same in their real lives (Tseng, 2010). This particular section includes the facts collected from their past experiences and studies on the similar subject matter. The literature review covers the wide range of experiences and information of the renowned researcher who have already studied the subject matter and came up with their views. According to Fernando.et.al, (2013) Mobile computing in the present times is the most popular technological advancement which had influenced a large sector of the people and the societies. Mobile computing is referred to the technology which permits the transfer of voice, data and videos through computer or other wireless devices without connecting to any of the fixed substantial connection. With the increase in the adoption of smart mobile devices like tables, smart phones, etc. had significantly altered the ways of living and carrying out the day to day activities. The basic concept of mobile computing includes mobile hardware, mobile software and mobile communications. Mobile computing is mainly utilized for illustrating the use of computing devices which generally cooperates with an information system while an individual is out of the fixed workplace. It has been found that the technology of mobile computing facilitates in mobile users to access, create, store, process and convey the information without any of the stable location. It helps in expanding the reach of the individuals through interaction and exchange of the information in the larger areas (Hawkins.et.al, 2010). It is been considered as the area of building a platform of information management which is not bound from any of specific location and the challenges from the spaces. This technology allows the flow of information through wireless channels and facilitates the mobility to the users. In past few years there has been a remarkable revolution in the mobile sectors. New technologies in mobile phones had made a significant impact on the individuals and the societies as well. The mobile computing devices such as laptops, smart phones, tablets, i-pods, etc. have provided with new phase of instant communication and the traditional modes of communication had undergone complete restoration due to these devices. As per Gikas and Grant (2013), the mobile technological solutions had become major parts in the daily routines of the individuals and the society at large. The mobile computing helps in merging the communicational mediums with the widespread capabilities of the internet and merges them with the influential, moveable and intuitive devices which could assist in bringing improvements in the daily livings. However, on the contrary to this, Wallace.et.al, (2012) stated that mobile computing had also made the society at risk over their security and safety concerns. As with the flexibility in the transformation of the information the security concerns over the sources increases at the large extent. It has been found that it is unsafe to connect with the other devices as it could lead to the misuse of any of the confidential data. It has been observed that as mobile computing devices facilitate the users to connect with the virtual world anywhere, anytime as they want. This had decreased the opportunities of interacting with the individuals and had limited the tradition ways of communicating and exploring the outer world. In addition to this, the major impacts is the security concern over the confidential data as the mobiles, laptops or other devices when connected to Wi-Fi or other channels could be hacked, monitored or controlled by anyone else and misuse the same. As per Chen and Kamara (2011), the mobile computing has emerged with a widespread impacts on the society. The people have become much aware about the technological use but are not wholly familiar with the issues which could be faced by them. In order to overcome with the issues faced by the mobile computing various measures could be adopted like creating clear policies for accessing the networks, making the users aware about the risks, execute the mobile and cloud based security, etc. The users must be encouraged to use the technologies in an appropriate manner and must be educated against the fraudulent as well. It has been found that with the increase in the awareness about the risk factors the people would use the devices and networks with more attentiveness and security. With the help of adequate knowledge and understanding about the risk factors people would be able to monitor the activities and keep an eye over it. Moreover, these initiatives would help the society in diminishing the impacts at large. In addition to this, people must also know as how to make use of the networks. For instance, Using Wi-Fi for the transmission of data might not be encrypted always and thus the information could be intercepted. The section of research methodology provides with a thought about the way in which the research is been conducted. This section provides with the techniques and tools to be used for collecting the required data and analyze them accordingly for the final outcomes. Moreover, current study would be qualitative in nature and carried out on the basis of secondary data and analysis of the facts. The analysis of this report would be conducted by framing themes out of the literature review and then analyzing the facts on the basis of information collected through various secondary sources like journals, books, online articles, etc (Panneerselvam, 2014). This technique would prove to be time and cost efficient for the researcher and would help in extracting relevant and effective results out of it. The methodology provides with the systematic flow of the research and would assist in drawing effective conclusions. Ethical considerations are been considered as the most important section while carrying out any of the research as it provides with the enhancement in the authenticity and reliability of the information included in the study. The researcher in the present study had focused on the collection of reliable and relevant data and information from different sources. The data had been analyzed properly without any of the biasness or misrepresentations in the report (Bryman, 2015). The researcher had also strived hard to include all the relevant data with respect to the subject matter and had also referenced properly from the previous prominent scholars and researchers who had revealed the facts and figures with respect to concerned topic. As per Gikas and Grant (2013), the mobile computing had facilitated the people to merge the communicational mediums to the internet and link them with the influential, moveable and intuitive devices which could assist in bringing improvements in the daily activities. With the use of these mobile computing devices the concerns over the confidentiality and the security of the confidential information had been increased. It has been observed that with the increase in the technological advancement the people had also initiated misusing the techniques like hacking, and stealing the data from the systems. The laptops or the mobile phones could be assessed to anyone and could use the information in any way. It has been found that it is unsafe to connect with the other devices as it could lead to the misuse of any of the confidential data. It has been observed that with the help of mobile phones and other devices people had largely involved in the virtual world and thus lacks in the face to face or individual communication within the society. Thus these aspects are decreasing the gaps between the developments but increasing gaps among people in a society. With respect to overcome with the impacts of the mobile computing, it has been found that making the people aware about the pros and cons of the activities would effectively make them use the technologies smartly. As per Chen and Kamara (2011), the users of mobile computing must be influenced to use the technologies in an appropriate manner and must be educated against the fraudulent as well. It has been found that with the increase in the awareness about the risk factors the people would use the devices and networks with more attentiveness and secured manner. It is seen that people with mobile computing devices are free to move anywhere, anytime and could perform their task as required. It is very much important that the people making use of this technology must be familiar with each and every constraint and could handle small activities on their levels only. It has also been found that people lacking in the knowledge about the security aspects could get affected with the issues like loss of important information, access by any unknown person, misuse of the data, etc (Laurila.et.la, 2012). An individual must be capable enough to store its important data safely like by using the cloud facility so that do not face any losses, etc. With the above report it had been found that with the increase in the adoption of smart mobile devices like tables, smart phones, etc. had significantly altered the ways of living and carrying out the day to day activities. It has been also found that mobile computing is mainly utilized for illustrating the use of computing devices which generally cooperates with an information system while an individual is out of the fixed workplace. The report had also revealed that mobile computing devices had assisted the users for getting into contact with the virtual world anywhere, anytime as they want which had decreased the opportunities of communicating with the individuals and thus had limited the tradition ways of communicating and exploring the outer world. However, the mobile computing had a significant contribution in the modification in the society at large. Bryman, A., 2015. Social research methods. Oxford university press. Chen, Y. and Kamara, J.M., 2011. A framework for using mobile computing for information management on construction sites. Automation in Construction, 20(7), pp.776-788. Fernando, N., Loke, S.W. and Rahayu, W., 2013. Mobile cloud computing: A survey. Future Generation Computer Systems, 29(1), pp.84-106. Gikas, J. and Grant, M.M., 2013. Mobile computing devices in higher education: Student perspectives on learning with cellphones, smartphones & social media. The Internet and Higher Education, 19, pp.18-26. Hawkins, J.C., Cinque, P.S., Shirai, G.T., Haitani, R.Y. and Gayed, N., Palm, Inc., 2010. Mobile computing device interface. U.S. Patent 7,738,912. Laurila, J.K., Gatica-Perez, D., Aad, I., Bornet, O., Do, T.M.T., Dousse, O., Eberle, J. and Miettinen, M., 2012. The mobile data challenge: Big data for mobile computing research. In Pervasive Computing (No. EPFL-CONF-192489).